Maharishi Mahesh Yogi was a disciple and assistant of Swami Brahmananda Saraswati, the Shankaracharya of Jyotirmath in the Himalayas. The Maharishi credits Sw Brahmananda Saraswati with inspiring his teachings. In 1955, the Maharishi began to introduce his Transcendental Meditation to India and the world. His first global tour began in 1958. “Maharishi Mahesh Yogi paid a visit to Mataji who received him in the hall in the presence of a fairly large congregation. The Maharshi had brought pandits with him who recited hymns to Devi from various scriptures with remarkable skill and feeling for over an hour. Then Sri Mahesh Yogi talked about his transcendental meditation and his work of spreading it in all countries of the world. “In 1981 during the Vedic Science course in Delhi, Maharishi sent a large group to the Taj Mahal for a visit. While in Agra, the group heard that the great saint Sri Anandamayee Ma was at her place in Vrindavan, which was on the route back to Delhi from Agra. Maharishi enthusiastically said the group should visit her and to take shawls, saris, fruits, garlands, sweets as our gift. The group arrived at twilight and meditated in a group outside her house while waiting for their chance to go up to the roof of the house where she gave darshan. While the group was waiting two giant white birds flew low over her house the celestial quality of the sight made everyone gasp. Dr. Bevan Morris asked the receptionist to inform Sri Anandamayee Ma that we were from Maharishi. But the group had to go up in sections of ten as the space was limited. Dr. Morris went up in the last group, and found that Sri Ananda Mayee Ma was sitting deeply withdrawn not paying attention to the people coming and going, and the pile of cloth, flowers, fruit etc. that had been placed in front of her. At that stage she was very elderly, and near the end of her Earth days. It was immediately obvious to Dr. Morris that she had not been told that this was Maharishi’s group. He asked the administrator again to please tell Sri Ananda Mayee Ma that these people were sent by Maharishi to see her. The administrator began to speak to her in Bengali and at the point where he said “Maharishi Mahesh Yogi” Sri Ananda Mayee Ma suddenly sat bolt upright and folded her palms together, and then started grabbing fruits and flowers and wrapping them up in packages, and giving them to us to deliver to Maharishi. Then she gave a sublime message of devoted greeting and love to convey to Maharishi. The group upon reaching Delhi delivered this message to Maharishi’s great joy. On another occasion Maharishi was doing Puja with Sri Ananda Mayee Ma at her place in Haridwar, but finally Maharishi had to go. He told Sri Ananda Mayee Ma, “Ma you stay here and continue, and I will go”. She seemed to agree and let him go, but after a few moments got up and followed Maharishi out to the car, walking a little behind him with the sweetness of a small child. There was a mala wala – a garland salesman – with a basket full to the brim with marigold garlands on the street there, and Sri Ananda Mayee Ma pointed to him so that her assistant purchased the whole basket. Then Sri Ananda Mayee Ma took the whole basket to where Maharishi was now sitting in the car, and she tipped the whole basket of garlands through the window into his lap”. 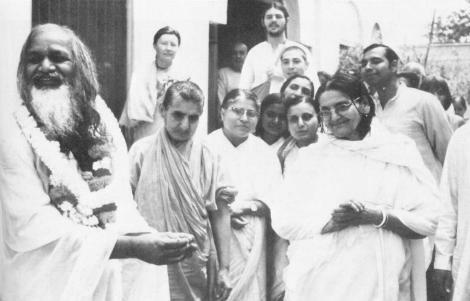 Another unverified report: Ma was seated with many devotees in the large hall across the lane from the Ganga side; Maharishi gave a talk to all present not only about Transcendental Meditation but also, I recall, emphasising to Ma’s devotees that such was Ma’s Nature that, if they really wanted to know Her, they needed to transcend, to experience transcendental pure consciousness. Afterwards Ma’s ladies sang very beautifully the Hymn to Narayani from the Durga Saptasati. Another occasion: Ma was seated to the right of the deity in the little temple across the lane in Kankhal, with Maharishi seated across from Her. On this occasion, Maharishi and his pundit performed puja and arati to Ma. As Maharishi left, Ma followed him out of the temple with her hands folded in namaskar chanting softly “Namo Narayan, Namo Narayan”. Maharishi asked one of his disciples to get some flowers from the flower sellers in the lane. A whole basket was brought and Maharishi walked backwards to his car sprinkling the flowers along the path where Ma walked following him. When Maharishi was about to get into his car, Ma indicated to one of her disciples to get a basket of flowers and tipped the whole basket over Maharishi as he stood there. Another story from Farouk Anklisaria, who was an Indian teacher of Transcendental Meditation and a lawyer. Farouk, one day, was arranging a course of instruction in TM for a Justice of the Supreme Court of India. The Justice told Farouk that he was a devotee of Anandamayi Ma and asked if it was still alright that he learned Transcendental Meditation. Farouk told him not to worry since Maharishi and Ma were very good friends. Later, Farouk had the chance to relate this to Maharishi himself. From Ananda Varta, Vol 3 1977.